Benji-Liine, nestled in a hillock near the beautiful confluence of Sisa and Siyik rivers at a place called Saayi in between Poyom and Boru Raksap village amid rich varieties of flora and fauna is a sacred place for the tribal people and one of the most potential destinations for tourists and believers of Hindu faith across the country. It has withstood test of time and continue to kindle tribal faith, myths and spirit of life from time immemorial. It is intricately woven in our myths and mythologies and stands today as epitome of sagacity and benevolence embedded deep into tribal psyche and philosophy of life. 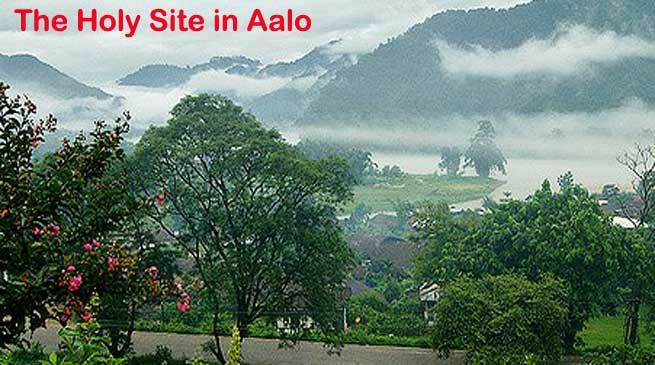 is located at a distance of about 45 km from the district headquarters Aalo, Arunachal Pradesh and takes a foot march of 8km from Darak circle to holy site of Benji Liine. The word Benji signifies supernatural power that has been the guiding force behind the existence of tribal society through the ages and Liine denotes a miraculous Mother Stone bearing seven offspring. BENJI-LINE is seated on a cemented floor base with CGI sheet roofing with her seven off springs in a row around her and these off springs are locally named as JIBI, JIZAB, JIPU, JIJI,JIPO, JINYA and JIYI. This Mother Stone measuring 1.5ft in height and around 2ft in width bears white colour on the top of the head and left side of the stomach is broken but it is rejoined to regain its originality. Of late the colour on the top of its head is gradually fading away due to excessive pouring of oil and other ritual materials by the devotees coming all over from India. In the absence of written history and literature, we delve into oral literature handed down to us from generation to generation and legend reveals various miraculous feats of Benji Liine and it is said that many years ago, entire stretch of jungle including this holy site was brought under jhum cultivation by the villagers by burning the jungles. People were surprised and taken aback when they found that entire jungle caught fire except the grasses surrounding the hill top where the stone is situated. This forced the main Priest to conduct a chicken liver examination, a traditional practice of tribal people to go in details into omen attached to it and the test proved myth, spiritual and divine power in it. The stone which was popularly known as a Saayi Liine deriving it from the place where it is situated was named as Benji Liine and began to be worshipped. The legend also reveals startling facts and instances that prove divine power in Benji Liine. It is said that a young damsel, Miss Nyarik Boje was arranged forced marriage with an old man by her parents to her utter dislike and dismay. She opposed it bitterly and one day she ran away from the village in protest against such marriage and went to BENJI-LINE site. She picked up one of the stones named JIBI and threw it into the SISA River with an intention to commit suicide. Surprisingly, the daughter stone JIBI came back to its original seat but the girl who threw the stone into the river became sick and remained insane for many years. The girl could be cured only after performing rituals by the priest and village elders. It is also believed that people who are destined to live a long life cannot lift the stone above ones shoulder and one who lifts it above the shoulder is an indicative of leading a short span of life. Once upon a time, a young man lifted the BENJI-LINE above his head and it fell down after lifting and left side of the stomach of the stone was damaged in the process. The man who lifted Benji Liine died soon after reaching his home. There is also a strong believe that barren couple for five to ten years who offers whole hearted prayers at BENJI-Liine conceives soon and many couples had been to the place got blessed with offspring after prayers. There is no dearth of societal efforts to keep up its traditional sagacity to promote it as a Tribal Cultural Heritage Centre and a potential tourist destination in a countryside to heed for. The Benji Liine Develop Committee has been formed under the chairmanship of Shri Dejar Poyom and the committee is running from pillar to post to get it recognized as Tribal Heritage, Prayer Centre and infrastructural development of the holy site for visitors and devotees within and outside the state. But till now nothing concrete could be done to safeguard it as a sacred place. Once there was a regular priest for performing puja but at present neither priest nor caretaker is residing there. The Holy Site is open to all and given free access to all type of devotees in their own ways to offer prayers. During Shivratri and Bol-Bom Puja, the Circle headquarter Darak buzzes with Shiva Bhakts and believers of Hindu faiths. Camps are set up there and devotees from different parts of the country march on foot covering 8km to offer their prayers. The then Governor of Arunachal of Arunachal, Mata Prasad too visited the site on foot in the year 1993 with team of doctors, volunteers, evacuation team and other dignitaries to inaugurate the Mandir there. The then State Chief Minister Shri Gegong Apang and many dignitaries of the state too have visited the holy site from time to time. Communication bottleneck is coming as a stumbling block for visiting dignitaries, devotees and pilgrims from all parts of the country. Any visible developments and infrastructures there have come up through head loads. There is Katcha road connecting Darak to Boru Raksap village via Benji Liine but the road end is blocked and remains deteriorated round the year. An all weather road is not only a dire necessity to connect this holy site comfortably but to link villages situated along the road to Darak Circle.